A while back, Veeam release their Explorer for Microsoft Exchange, which brought to Exchange the ability to quickly and easily recover single items from a Veeam-based Exchange backup. As someone that has significant experience with Exchange, I found that product extremely useful. With traditional recovery tools, recovering single items from a mailbox was an arduous task that required careful planning. And then Veeam came along and made it look easy. Now, Veeam aims to bring the same ease of use to SharePoint. SharePoint recovery can be tricky, particularly if you just need to recover individual objects or lists. 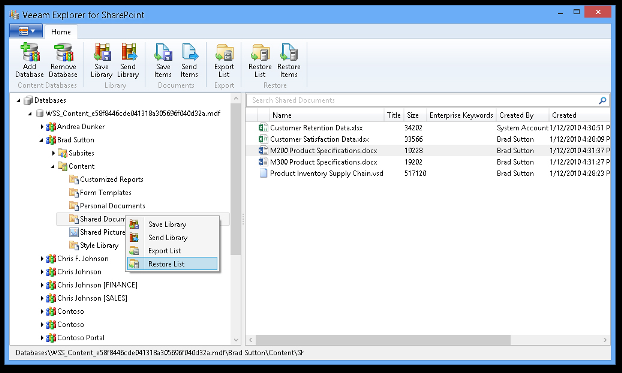 Veeam’s Explorer for Microsoft SharePoint brings granular item recovery to this process with the ease of use you probably expect from Veeam. Better yet, this tool will be free and will be included in version 7 of Veeam’s backup products. To register for the beta, visit Veeam’s SharePoint Recovery page.